The water taxi that I took to the gym in Mexico only operates until 7:30 pm, which forced me one evening to return to the house that I shared in north Mazatlán on the late evening bus. “It’s a good thing you’re so white, or I wouldn’t have seen you!” exclaimed the bus driver (in Spanish of course) as I stepped on board. His expression immediately turns sheepish, concerned that he has blurted out a racist remark instead of stating the mere fact of my spectral image, like the Ghost of Christmas past, waving him down from the side of the road in the near dark. Buses here will stop practically anywhere, anytime but at this time of night they sometimes zoom by me as they compete with one another for the phantom nocturnal finish line. My dancing by the side of the road seems to help, any sense of personal dignity dissolved by the anonymity of the darkness and the work out at a 95-degree dew point. Tuning in to invisible headphones, I wave my hands above my head and nod my head in tandem to whatever song (earworm) I can’t get out of my head that day. The drivers are usually laughing at me when I board, a nice way to start the ride. These late evening bus rides have become one of my favorite parts of the day. Often the bus is empty. I sit in the front passenger seat, my eyes glued to the road with the driver’s, like my uncle’s Irish setter used to do from the front seat of his Ford Explorer back in Colorado. Not long ago I stepped on to Madonna’s “Material World” playing solidly through the bus driver’s personal music player. I had never realized what a hard song it is to sit still to. What began as a little mutual head-bobbing ended up with the driver and I belting out the refrain, humming audibly to the same missed words. I thanked him as I boogied off, he grinned and waved. A few nights before, I took one of the non-air conditioned buses that travels with all the windows open. As we sped along the mostly deserted section of road toward my neighborhood of Sabalo Cerritos, we passed a peloton of road bikers, their red seat lights flashing reassuringly in the darkness. The open windows allowed a moment of waving and cheering as we all continued our journey together in the night. Most Recent: How what you read in the American press can make you illogically spooked when you first start traveling to Mexico. It's just the wind. Kerry Baker is the author of "Interactive Guide for Learning Spanish Free Online." The book curates and organizes the best free Spanish language tools on the web, creating hundreds of unique lessons. Don't pay hundreds of dollars because a company can advertise more - find the best free teaching sites online through The Guide. 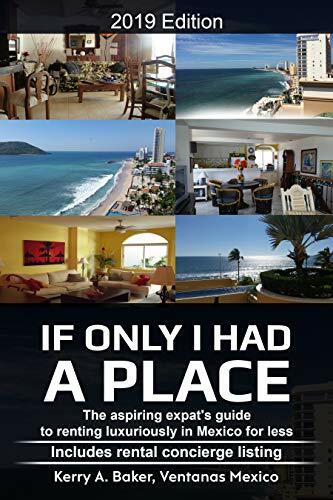 Her book "If Only I Had a Place" is a guide to renting luxuriously in Mexico for less. This book gives you a comprehensive system to avoid the pitfalls and take advantage of the benefits of being an expat.